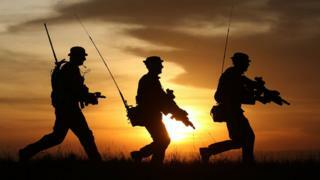 The number of soldiers in the British Army has continued to fall, new figures from the Ministry of Defence show. In April 2017, there were 78,407 full-time and fully-trained troops - nearly 4,000 short of the government's target of 82,000. The last time the force hit its troop target was April 2015. The RAF and Navy are also below strength. The Army says it has enough personnel to meet its commitments, and that recruitment is increasing. Where are British troops deployed overseas? Between April 2016 and March this year, 8,194 soldiers joined the British Army. However, 9,775 left during the same period, with family life and "opportunities outside the forces" among the reasons given. This leaves the MoD 5.1% below its Army target, compared with 4.8% in the RAF and 2% in the Navy and Royal Marines. A document released by the department on Thursday said: "There is no single reason why personnel leave on voluntary outflow. "But the personnel who completed the armed forces continuous attitude survey indicated reasons for leaving the armed forces included the impact of service life on family and personal life, and opportunities outside the armed forces." A spokesman from the Army said the force had enough people to "meet all our current commitments at home and abroad", and said recruitment numbers were on the rise. In 2015, the Army completed its plan to reduce the number of personnel by more than 20,000 - three years ahead of target - leading to a number of redundancies. They then embarked on a project to recruit more reservists to the force, as part of austerity measures. Of the 9,775 to leave in the last year, only three were because of redundancies.